Now that the weather is starting to get colder, I’m trying to get back into the tea drinking habit. I stopped during the warmer months, and was just drinking tons of water, but it’s just so important to drink green (and black) tea! I guess what made me think of it again was that my allergies have been the worst they’ve ever been in years! They were driving me crazy. Sneezing, sniffling, runny nose. The symptoms would be torture and then all of a sudden disappear, only to reappear again later. I know green tea has been very helpful in the past when I have visited houses with cats. I’m highly allergic to cats, and bringing a big thermos of hot green tea has always helped alleviate the symptoms. So, I figured it was worth a shot to try to clear up my allergies, and guess what! It’s working! I’ve only been drinking a cup or so for 3 days, and already I can see a major difference. My allergies are not bad at all. I’m still a big clogged up, but at least I am not dripping and sneezing every 10 minutes. And it’s so much better than taking a prescription pill! And green (and black) tea is great for all sorts of other ailments, including cancer prevention and treatment, with its anti-oxidants. I usually drink decaf, but I’m going to try to get into the normal caffeinated green tea. I’ll just make sure I drink it early enough in the day so it won’t affect my sleep. I need to purchase some more herbal teas too for night time use. 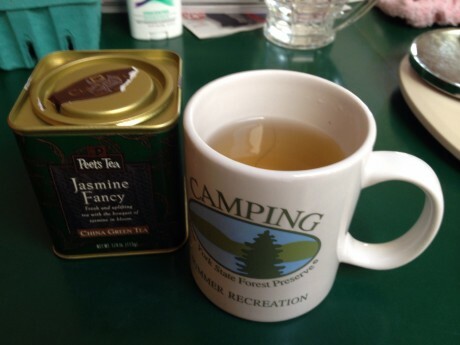 Chamomile is lovely, as is lemon herbal tea. I used to purchase my loose herbal fruit teas from Adagio Teas but I just looked back at my order history, and it’s been years since I last purchased. Yikes. The tea in my tins is years old. Not good. I also am a bit nervous using hot water in the plastic IngenuiTEA teapot I have. It’s a great tea brewer, but I just don’t think boiling water belongs in plastic. 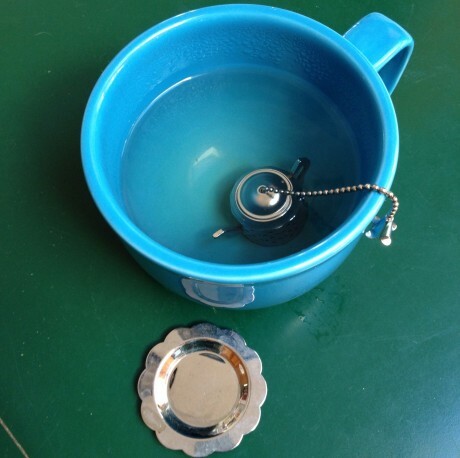 I emailed them to inquire about BPA in the tea pot that was purchased a few years ago and they replied (very promptly) that "Our ingenuiTEA teapot was tested by SGS and found to be BPA-free." That’s good news for current users, but they didn’t really give me a direct answer about my older model. I don’t know if they are using the same manufacturing process as years ago. 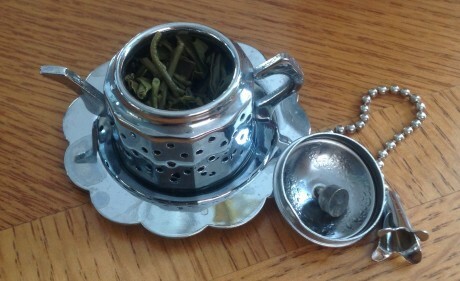 I have a little metal tea ball thingie that I will use to brew my loose tea from now on just to be on the safe side. 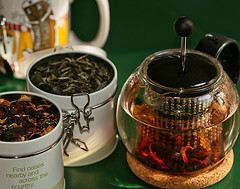 I did find an older glass Bodum tea pot (see photo below), but the middle brewing part is also made of plastic. As I said, even if it were BPA free, I just don’t think plastic should be heated in any situation. They also aren’t offering 5oz tea “refill” bags for customers that already have tins. When I inquired, they answered: "Since your last order, our metal tins had given way to flexible packaging, making the “refill” option no longer necessary, as all teas now come in bags." So I asked if the tins were still okay to use, but they didn’t answer. To be fair, it could be that question got lost within my BPA question. I assume they are fine to still use, since Adagio is still selling the tins as an extra purchase. They might even be better quality than the newer ones! I still don’t know that I’ll be ordering again from Adagio. They offer wonderful, high quality teas, but it’s so darned costly. My last order (Nov 2007) of Fruit Medley herbal tea cost $6.50 for 5 oz refill bag. Now it’s $6 for only 3 oz. Add on shipping $3.75, and that’s almost $10 for 3 oz of tea! I’m going to explore some of the teas at Whole Foods and compare. I admit it’s going to be hard to find such good quality, but we’ll see.